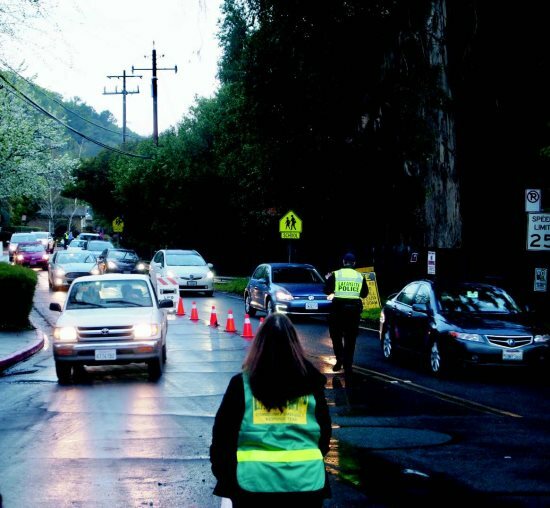 In the dark and with rain falling at 6 a.m. on Saturday, March 23, well over 100 volunteers from 10 agencies shuffled into the gym at Acalanes High School to receive instructions for the emergency evacuation drill of Springhill Road. The Lafayette Police Department drone was at the ready, the mobile command center was set up and, with coffee and donuts on hand, everyone was ready and eager to get to work. With the imagined scenario of wildfire approaching residences from Briones, the challenge was to get people out as effectively as possible. Lafayette's drill comes on the heels of similar exercises in Moraga and Orinda. It was a deliberate decision to run this drill in the Springhill neighborhood. 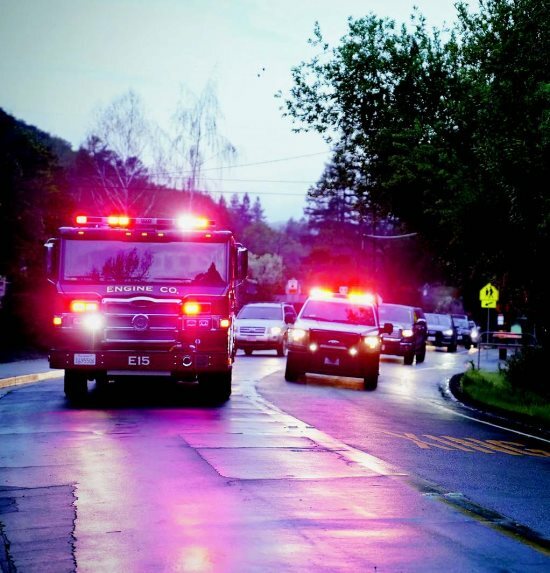 With only one road in and out, and nestled into the open space hillside of Briones, it is both lovely and potentially one of the most challenging areas in Lafayette for emergency services to evacuate in an emergency. 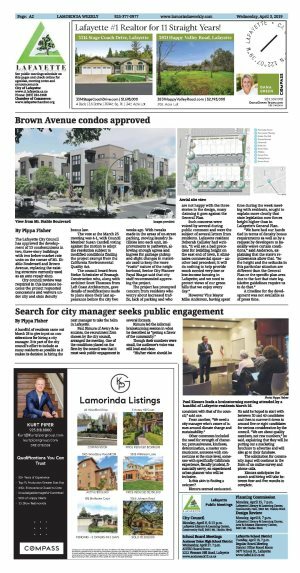 In the weeks prior to the drill Springhill Valley Homeowners Association President Paul Melmed and 10 volunteers went door-to-door visiting the roughly 250 homes, handing out informational fliers, largely helping the drive for Lafayette residents to sign up for Community Warning System alerts. During March alone, 209 residents registered to receive CWS alerts. In the Springhill area 106 residents "opted in" to participate in the drill. And at 7 a.m. those 106 residents received alerts to evacuate the area. With volunteers fanned out along Springhill Road a fire truck led the first wave out. The road was closed at Pleasant Hill Road to westbound traffic between 7 and 8 a.m. to allow the use of both lanes of the road in one direction only. Fifteen minutes later a second wave came through with a simulation of 35 volunteers who were evacuated from the Girl Scout Camp all the way at the end of the road. As volunteers counted cars out, it appeared that a total of 98 vehicles took part in the drill. People were taking it seriously. Springhill resident Roni Melmed described a visceral reaction after the alert, as she got ready to evacuate. "My pulse was racing. This could actually happen here," she said. Lafayette Chief of Police Ben Alldritt was very pleased with the level of community engagement and participation in the drill. "There are approximately 250 homes in the Springhill area and the number of participants was fantastic," he said. "I want to thank those that participated, getting up early on a Saturday morning, and supporting Police and Fire as we continue to evolve our evacuation plans." Noting the number of volunteers who participated to make the drill successful, Alldritt thanked Lamorinda Community Emergency Response Team, Lafayette Emergency Preparedness Commission, Contra Costa Sheriff's Office, Community Warning System, especially Livia Pop, OES & Search and Rescue, Reserve Deputies, Contra Costa County Fire, Moraga-Orinda Fire, Springhill residents and the Springhill HOA and its board of directors and Lafayette City and Police Department staff. Surveys sent to residents and all drill volunteers following the exercise are currently being reviewed. Alldritt says they will use that feedback to improve. "One of the big things out of this exercise was utilizing contra-flow traffic control as a method to evacuate people more quickly," says Alldritt. He points out the benefits of getting more residents engaged in registering for CWS, and understanding that this is the primary communications mechanism during emergencies, especially those that involve evacuation orders. Paul Melmed said that he was very impressed with the dedication and expertise of the Lafayette Police Department and all the agencies involved. "It is so important to know that help will be out there in an actual emergency." 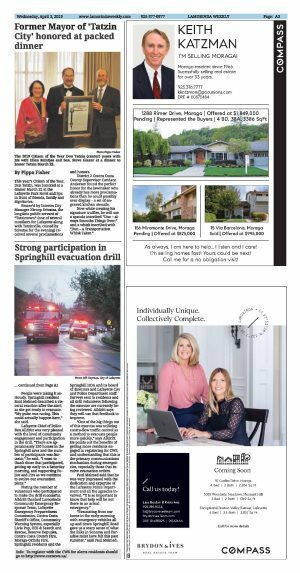 "Evacuating from our home in the early morning with emergency vehicles all up and down Springhill Road gave us a scary sense of what the folks in Sonoma and Paradise must have felt this past summer," said Paul Melmed. Info: To register with the CWS for alerts residents should go to http://www.cococws.us/.